Even though electronic devices have 110-240V chargers to work all over the world, the problem of different socket standards in different continents still remains. I got a taste of this at Schiphol airport in Amsterdam and was glad that Apple came my rescue. My Canon G5 digital camera was indicating low battery so I thought I better charge it before I plan anything for my 11hr wait for my connection. I found power sockets at and near the communication center and took out the charger for my camera. It was then I noticed that the plug for charger's cord was a polarized one(Type A new) and the adapter I had (North American Type A -> European Type F) wouldn't take it in. The adapter was only built for a non-polarized plug(Type A old). I thought about it for a while and then realized that my MacBook Pro's charger has a detachable plug. The detachable plug is not polarized and it easily fit the adapter plug. 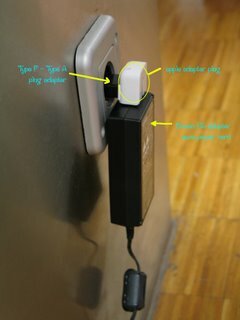 The charger for the camera was connected to the adapter+plug by eliminating the power cord! So thanks to Apple for coming to my Canon G5's rescue. Rescue indeed. This image tells me that the double pin and steel button stud is a universal mating system. Hurrah! ! !